You know those moments when you click with a total stranger (on the metro or at a party or in the laundromat) then they disappear into the urban chaos from whence they came? Later, you romanticize about them. You wonder if they felt the same way. You only wish you’d had the courage to ask for their number. Or were you just imagining it all? These moments are the subject of Missed Connections, a gorgeous illustrated blog which uses stories of missed connections culled from real life personal ads to inspire beautifully rendered drawings. Besides the artwork, it’s amazing how much wordsmithing goes into the personal ads themselves. When it comes to love (and prices by the word) people quickly become poets. 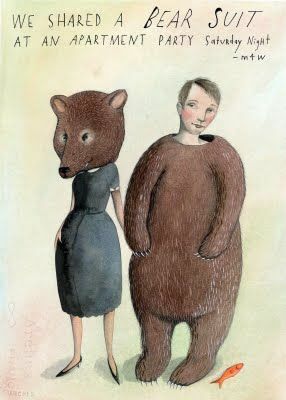 Blogger Sophie Blackall choses her inspiration well, picking those personal ads with the most potential for visuals, my favourite being a guy looking for a girl he shared a bear suit with at a costume party. Thinking about it, the FC and I could easily have been a missed connection. We met at a party, danced and laughed for what felt like hours, then, when my friends were leaving, I bid farewell and disappeared into the night. We would never have seen each other again if the FC hadn’t tracked me down on Facebook. (He remembered the person who brought us to the party and started his search from there.) My heart pounded in my chest when I received his first email message. It was so wonderful to know that he felt the same as I did, that something magical had happened between us. I was also glad I’d decided to join Facebook since without it I might not be writing this post. This entry was posted on Monday, February 1st, 2010 at 6:50 pm	and is filed under Uncategorized. You can follow any responses to this entry through the RSS 2.0 feed. You can leave a response, or trackback from your own site. this is amazing and an addictive read.. thx for sharing! I so love that blog!